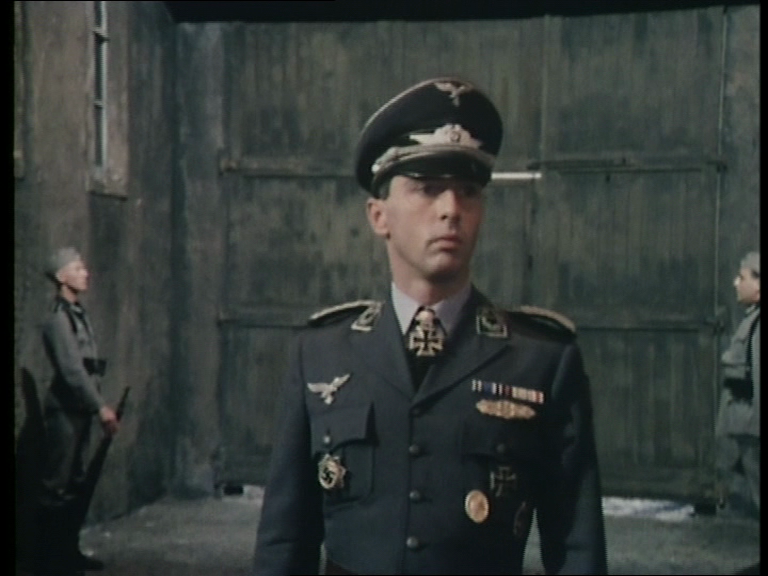 It is 18 March 1974 and time for another episode of Colditz. While the Kommandant (Bernard Hepton) is away, Major Mohn (Anthony Valentine) is left in charge of Colditz. When he learns via a lover that the German effort is close to defeat, and that his close connections to the Nazi government may see him executed for war crimes, he goes into a panic and tries ingratiating himself with the camp's prisoners. "Chameleon" is an episode that has been a long time coming, ever since the deeply odious and unlikeable Horst Mohn joined the cast at the beginning of the season. He has constantly over-stepped his authority, broken the Geneva Convention, and pushed hard for the treatment of the prisoners to be harsher and more punitive than his superior has allowed. The swing in this episode is sudden and remarkable: he begins the episode at his most powerful to date, and ends it at his very lowest and most desperate. It is a fabulous and final showcase for Anthony Valentine, who has done an excellent job of making Mohn a perfect combination of entertaining and repellent. He is the archetypal 'man you love to hate', giving Lt Carter (David McCallum) an effective foil throughout the season as well as introducing a genuine Nazi into the German cast. It is not a surprise, after his constant taunts, jibes and threats, that Mohn would so easily crack under pressure. He tries sweet talking the prisoners, he tries making reciprocal deals, and he even attempts flat-out bribery. None of it works, because he sealed his fate the minute he chose to side with Adolf Hitler. The episode, which is written by Robert Muller, takes a slow and measured pace. It carefully ratchets up the tension, keeping the viewer waiting until the very end to discover Mohn's fate. Even then it partially denies the audience its satisfaction: this has always been a realistic, grounded drama, and the over-the-top arrest or execution of Mohn would run counter to the tone of the entire series. There is definitely satisfaction to be had, but perhaps not as much as the average viewer would want. It feels like the right creative choice. Mohn's plight also continues to drive home the growing threat of a German defeat that has been rising over the past few episodes. While the war's end in theory means freedom for the prisoners, every episode has raised the chances that the Waffen SS may invade and execute them all before than happens. It is making these final episodes - after this there are only two to go - increasingly suspenseful.